Inflatable Sport RunaboutsRugged "Roll Up" Runabouts! 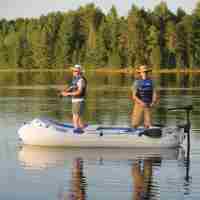 Inflatable Motormount BoatsA Fisherman's Dream! Rigid Inflatable BoatBest of both worlds Rigid & Inflatable! The Sea Eagle RIB is an outstanding all-purpose rigid inflatable boat! 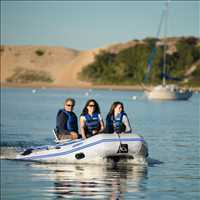 Durable and rugged, makes a great ship to shore tender and is fun for running about. A combination of both rigid and inflatable provides you the very best of both worlds! The values of an inflatable are endless. Incredible buoyancy and added safety provided by 3 separate, non-rigid, independent, inflatable air chambers are second to none. Primary and secondary stability make for boarding and disembarking with ease. The knowledge that both can be performed safely without causing damage to a mother vessel is certainly assuring. The superior strength FRP (fiber reinforced plastic) double layer floor provides unsurpassed durability and longevity. Great when beaching, providing added protection against rock and debris. The uniquely designed Deep V Multi-Chine Rigid Hull improves fuel economy and increases stability, provides rapid planning and incredible tracking, and most importantly a smooth responsive ride.